Greetings Retro-Adventurers, I am Dr. Timewarp (and no, I do not care to do the dance which bears my name again or…at all). I have recently obtained, by methods that best remain unexplained, Doctor Emmett Brown’s original chronal-hopping vehicle concept from Back To The Future, the Time Machine Refrigerator or TMR. With this device in my possession, I plan to travel into eras past and re-discover the trends that made them rad. You are welcome to join me, but just stay out of the crisper, that’s where Dr. Timewarp keeps his super duper secret stash of “Retro-Juice”. So where to first? There were so many desirable destinations for a child in the 80’s. Depending on their area of interest a young boy or girl might be found begging their parents for a trip to the skating rink, the local frozen yogurt shop or a video arcade. These are all fine choices, but without a doubt the mecca of children far and wide was the temple of all things plastic and fun, Toys R Us. So let’s set the dials to 1987 and make our way into those hallowed halls. Ah, we’ve arrived. Just look at that unmistakable color scheme. Pastel Blue, Burnt Orange, Green and Yellow all set against the earthy brown shingles, it’s a sure sign that we’ve arrived in the midst of the Reagan era. I suggest we enter swiftly, as I’ve heard stories of anthropomorphic Giraffe’s that guard these gates and we don’t want anything to delay our sightseeing. Also, there is no need to be alarmed by the yellowish haze that appears as you enter, the 70’s and 80’s both seemed to carry this aura with them. Kind of strange really. Behold, a most glorious sight indeed, these Masters of the Universe toys are a sure sign of the times. If you look carefully you’ll see such creatures as Roboto, Mantenna, Jitsu and Sy-Klone amongst the standard cast of characters. Any child who got that Castle Grayskull was the talk of the neighborhood indeed, but if they also had Snake Mountain they were just spoiled. These action figures provided much more entertainment than the cartoon that was used to promote them. Allow me to explain. Just like most people were only watching Wonder Woman for that moment when she spun around to transform, the same could be said for Prince Adam’s power-charged metamorphosis into He-Man. After the cowardly Cringer turned into the mighty Battle Cat, the rest of the show was just a lot of recycled animation and watered-down violence. The toys on the other hand, had much more engaging mini-comics that let the child’s imagination run wild. Except for that one about Stinkor when…wait, what’s this? It appears that they are having an in-store event where you can meet Skeletor and Man-E-Faces! Promotions like this were common at toy stores during this time. Get the kids in to meet their heroes and then watch them walk out of the store with the latest He-Man variant. Bah! It appears that the mustachioed employee is rushing them back to Eternia. Ah well, best that we don’t leave any photographic evidence of our presence here anyway. Onwards! Another welcome sight, shelves stacked to the ceiling with G.I. Joe Real American Hero vehicles and playsets. The box art for these toys was quite eye-catching, it always appeared as if the Joes and their Cobra enemies were emerging from an explosion and into your toy chest. Placed at various price points, there were dozens of tanks, helicopters and jets for Dusty, Shipwreck and Snake Eyes to get around in. One of the most exciting was the Cobra Wolf vehicle which was comprised of a cockpit and adjacent missile launchers all mounted on skiis! Finally a toy you could take outside during the winter months to continue the battle between good and evil on the frozen tundra. If looked at in the right light, it actually resembles one of the touchtone phones of the era. I think we’ve seen enough of these plastic warriors, let’s move on to the hippest trend in home entertainment, video games! As we leave the action figure aisle I think it’s worth mentioning a few more peg-warmers that are likely to catch your eye. Just look at those C.O.P.S. n’ Crooks toys. Bigger than G.I. Joes or Super Powers and packaged with cap guns that actually produced smokey sparks when fired, these figures provided a thrill few others could match. Oh and if it isn’t the Bionic Six. It was truly an odd concept to think that kids would want to play with a cyborg mother of 4 in action figure form, but the robotic gorilla, F.L.U.F.F.I. was 100% the right instinct for the Transformers loving rugrats. Finally, we’ve arrived! What’s that you say? You don’t see any video games here, only slips of paper? Well that’s because at this time in history the latest offering for the Nintendo Entertainment System or Sega Master System was simply too valuable (and easily shoplifted) to leave out in the open. So if you wanted to buy Rygar, you had to grab the slip of paper from the pouch beneath and hand it to the guardian of the gated “Game Vault” at the front of the store. Complicated you say? Maybe just a bit. Oh look, there’s the R.O.B. display. Much like the Power Glove that would be a released a few years later, this add-on to the system looked much better than it ever was. Only compatible with games like Gyromite or Stack-Up and even then not working so well, the Robotic Operating Buddy was nothing more than a vanity piece for those wishing they had their own personal Johnny 5 from Short Circuit. So why did it sell? Truthfully anything you put in a plexi-glass case will immediately have more perceived value than any item simply sitting in a box on a shelf. So I suppose it’s a case of cheers to the marketing team and jeers to the programmers. Goodness me! Did you see the blur of flesh and metal that just whizzed passed us? That child is emptying the shelves like a mad-person with no concern for what he’s putting in the cart. Oh, it must be one of those Toys R Us shopping sprees that were constantly being promoted on Nickelodeon. The idea of getting 5 minutes to run through a toy store and grab anything you wanted was more than most children could handle and likely resulted in many an elementary school heart attack. Often sponsored in conjunction with cereal companies, the combination of sugar, toys and television pretty much sums up the 80’s childhood experience. Don’t look now, but I think “Toy Run Tommy” just tipped us off to the "Giraffe Gestapo", they must suspect that we are chronally out of synch since we are not wearing knit sweaters with crazy patterns on them. Let’s take a shortcut through the girl’s toy aisle and head for the exit. Barbie is an ageless abomination who can’t be tied to any specific decade, but she had some competition during this time in the form of Jem and The Holograms. Just look at those wild hair colors and rocker fashions, "Truly Outrageous" is indeed an appropriate tag line. The fact that each doll came with a cassette tape of original music from the Saturday morning cartoon was even more groundbreaking, but not everyone likes innovation...or competition. You see, the announcement of Jem’s debut caused Mattel to rush the far inferior Barbie and the Rockers dolls into stores in an attempt to sabotage Jerrica and her bandmates’ chances for toy aisle stardom. Sounds like a plan more fitting of Jem’s rivals The Misfits, don’t you think? Oh and just below the rock stars we have He-Man’s sister, She-Ra: Princess of Power. The mix between a fashion doll and an action figure was an interesting experiment when it came to making toys of Adora and her band of Etherian rebels. Mattel essentially transformed their Masters of the Universe line by slimming down the figures and adding pink glitter sparkles to make it more accessible to young girls. The strangest thing was that She-Ra’s villains The Horde were produced as part of the He-Man line and in that style. So only the evil beauties like Catra and Scorpia were an even match scale-wise for the Princess of Power to battle. Gadzooks, Geoffery and his gang are gaining on us! Quick, let’s make a break for the exit, my friend. You take the GoBots Big Wheel and I’ll take the Transformers Power Cycle. I know the GoBots are a lame knock-off, but please there’s no time to go into that now, hop aboard that Cy-Kill facsimile and peddle for dear life! (Huff-Puff) This is really too bad, we didn't even get a chance to see Teddy Ruxpin or the Boglins, but if we're to keep on treading the retro-timestreams, it's like Dr. Klaw always says, "I'll get you next time..."
That was close. Toys R Us is much more dangerous than I had remembered. We’re safely in the TMR now, being carried gently by the timewarp. As frightening as those last few moments were, I hope you got a great sense of nostalgia by revisiting those colorful aisles lined with history’s greatest toy lines. So tell me my friend, what radical experience of days gone by shall we visit next? @BarryBgb Glad you had good memories at TRU. I got to work there for one holiday season and tried to keep that same sense of wonder as I was stocking the shelves and helping kids find their favorite toys. You can only go so many times before you get bored of it. 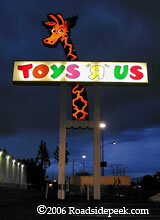 I lived by the Toys R Us when I was young from ages 2-8. Actually when relatives come to visit we would entrain them by taking them on a trip to the Toys R Us. My cousins used to buy board games and visit my house. Play the game at my house, and then return the game and complained it was "boring". That location closed in the mid 90s. It got replaced by the Montebello store by the mall. @pikachulover Wow, That's awesome! The clearance aisle was a favorite of mine too. If I had lived that close to TRU I would have been there every day after school hassling the employees about the latest X-Men figures in person, rather than on the phone. Toys R Us was a big part of my life from 1986-1992. I lived across the street from one. That is the way my family and the other people who lived on the 3 house lot gave directions to the houses. Now it's a UFC Gym. You could see the large Geoffry sign from the Freeway. I spent a lot of time in the "girl" aisles, but I liked to look at other stuff too like the bikes and art supplies. I miss all the seasonal stuff they carried like back to school supplies and Halloween stuff. When it was Christmas the parking lot was so full my family would just walk to the store. I used to get a lot of clearance items. My mom liked taking me down that aisle. It's okay. We like weird as long as it's a cool weird. @vkimo: Yeah, that security cage for the games is a vivid memory for me as well. It was just so mysterious. It was actual dreams I've had of returning to Toys R Us in the 80's that inspired this article. And yes, the good Doctor has a few more adventures up his sleeve. @Vaporman87 Those costumes would be an amazing, if not stinky find. I used to manage a KB Toy Store and the highlight of my life was when Spider-Man came for an in-store (Barbie was OK too). It was in 2001, so I'm not sure if it qualifies for the site, but I took a lot of pictures with him. I even convinced him to pose in the storage room with the mask off as if he was Peter Parker doing a quick change. Yeah, I'm a little weird. I was thinking the same thing. Of all the MOTU (And any toy line really) merchandising, it's the promo stuff that's the most valuable. Store displays, event promotional items, etc. This was a fun adventure Hoj... I mean, Dr. Timewarp. Thank you for taking us on it. Now if I can just figure out where that Man-E-Faces costume is these days, and have the person who owns it sell it to me. Will Dr. Timewarp be a reoccurring alter ego of Hoju Koolander? Very fun article. And bonus points on the actual vintage shots inside a Toys R Us! It was always an idea of mine as a youngster to buy a Toys R Us and just lock it up for 15 years then reopen it as a museum. How cool would that be?